We love Vine Storage. Got a great deal when we paid for a full year. Big spaces, lots of wiggle room for our very large RV and truck. Free ice machine, water, and dumping. Security gate with your own personal code, on sight security guy living in attached apartment in bldg. So convenient if you live in Redlands. Very pleased! Recreational vehicles are family investments that can serve you well for a long time if given proper protection. With good care, you will be exploring the great outdoors while still enjoying the comforts of home for years to come. This is why many RV owners seek reliable, safe, and secure RV storage at a storage facility they can trust. 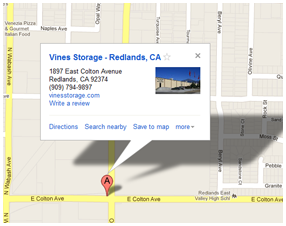 Vines Storage of the Redlands/Highland area has an extremely large warehouse facility that offers both indoor and outdoor RV storage. Indoor RV storage can securely protect your recreational vehicle from the elements. UV rays from the sun can damage the tires, awnings, and paint, so indoor storage is the key to getting the greatest benefits of storage for your RV. Our facility is large enough to accommodate the largest of recreational vehicles, and allows you to drive your RV into the facility on your own. Vines Storage is the only indoor self-park RV storage facility in Southern California, offering customers a chance to protect their investment while keeping it securely stored when necessary. While we do offer both indoor and outdoor storage, indoor RV storage is recommended for protecting your investment from theft as well as deterioration. Additionally, Vines Storage offers a number of amenities for RV owners. Our on-site ice maker generates 2,000 pounds of ice a day, and is available for our customers. We offer a commercial air compressor; filtered and purified water, battery charger, and sewage waste dump sites as additional advantages and amenities that our customers can enjoy for their own RV use. In the immediate area, there are several cities that do not allow for RVs to be parked along the street or outside of your home. If you are looking for a place to store your RV without incurring a ticket and hefty fine from the city, Vines Storage can help. Call today and ask about our special lease rates for long-term storage, or get a quote on month-to-month RV storage needs.